Today is the birthday (1691) of Peter Scheemakers or Pieter Scheemaeckers the Younger, a Flemish sculptor who worked for most of his life in London where his public and church sculptures in a classicist style had a significant influence on the development of sculpture. 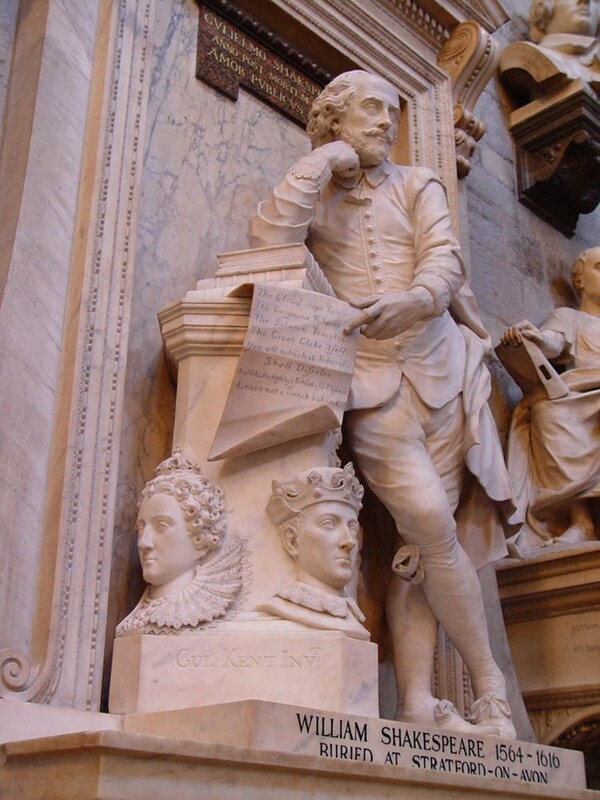 Scheemakers is perhaps best known for executing the William Kent-designed memorial to William Shakespeare which was erected in Poets’ Corner in Westminster Abbey in 1740. Scheemakers learned his art from his father, the Antwerp sculptor Pieter Scheemaeckers the Elder. 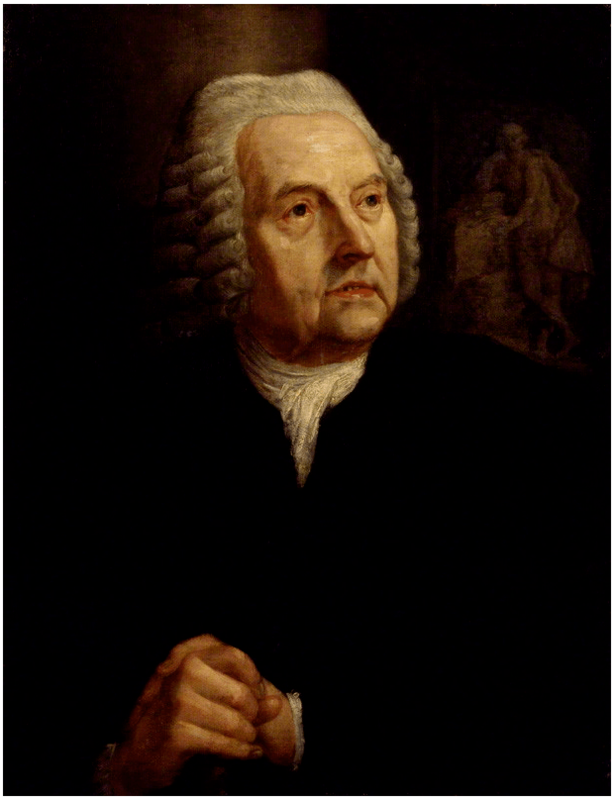 He visited Denmark where he studied for four years with the court sculptor Johann Adam Sturmberg (1683–1741). He walked to Rome where he and Laurent Delvaux studied both classical and baroque styles of sculpture before settling in London in 1716. He and Delvaux worked there with another Flemish sculptor Pieter-Denis Plumier on a funeral monument to John Sheffield, Duke of Buckingham, which they delivered in 1722 after the death of Plumier. In 1723, Scheemakers and Delvaux entered into a formal partnership and set up a workshop in Millbank in Westminster. 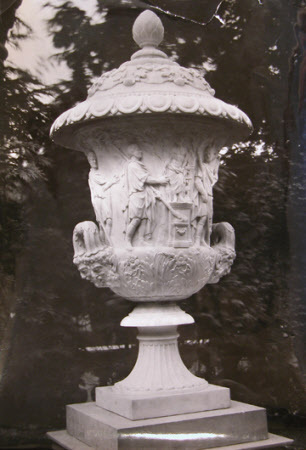 Their workshop produced many sober classical monuments and garden statuary. The partners sold their stock in the partnership and travelled to Rome in 1728. Scheemakers stayed here for two years to study both classical and contemporary masterpieces. Upon his return to England in 1730 Scheemakers restarted the Milbank workshop on his own. His ‘ideal’ classical sculptures became very popular with the landowning class and the city merchants. He moved his workshop a few times: first to Old Palace Yard in 1736 and then to Vine Street in 1740 where he was active until his retirement in 1771. He returned to Antwerp where he died at the age of 90. 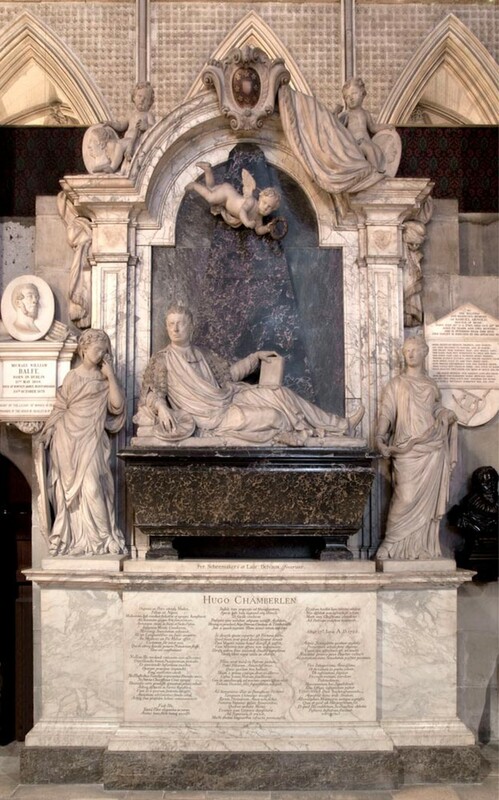 Fifteen of Scheemakers’ works – monuments, figures and busts – are in Westminster Abbey; two were executed in collaboration with Delvaux: the “Hugh Chamberlen” (d. 1728, and therefore perhaps produced during his first visit to London) and “Catherine, duchess of Buckinghamshire.” He is best known for his monument to Shakespeare (1740), but as this work was designed by Kent the credit is not all Scheemakers’. In addition to these, there are the monuments to Admiral Sir Charles Wager, Vice-Admiral Watson, Lieut.-General Percy Kirk, George Lord Viscount Howe, General Monck, and Sir Henry Belasye. 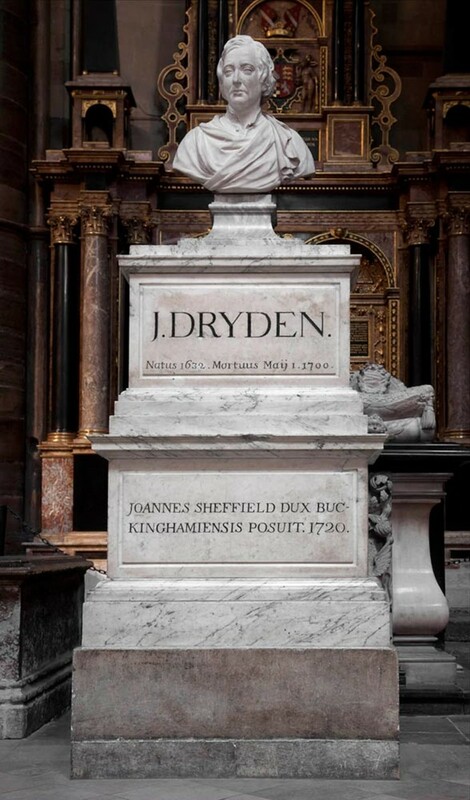 His busts of John Dryden (1720) and Dr Richard Mead (1754), also in the Abbey, are noted examples of his smaller works. Works outside of Westminster Abbey are memorials to the 1st and 2nd Dukes of Ancaster at Edenham, Lincolnshire; Lord Chancellor Hardwicke at Wimpole, Cambridgeshire; the Duke of Kent, his wives and daughters, at Fletton, Bedfordshire; the Earl of Shelburne, at Wycombe, Bucks; and the figure on the sarcophagus to Montague Sherrard Drake, at Amersham. Another example of his work is the memorial to Topham Foote (or Foot) in the parish church of St John the Baptist, Windsor. This burial monument, which includes the young man’s bust and the Foote family crest, greets visitors in the main High Street entrance, just 300 feet (90 m) from the Henry VIII gate to Windsor Castle. He also sculpted a memorial for the Petty family, marking the family burial place in All Saints’ Parish Church, High Wycombe, which depicts the family in Roman dress, and designed the gilded equestrian statue of King William III erected at Kingston upon Hull (1734). In 1743, Mary Coghill erected the parish church of Clonturk (now Drumcondra Church) in memory of her brother Marmaduke Coghill, and placed in it a statue of her brother by Scheemakers. 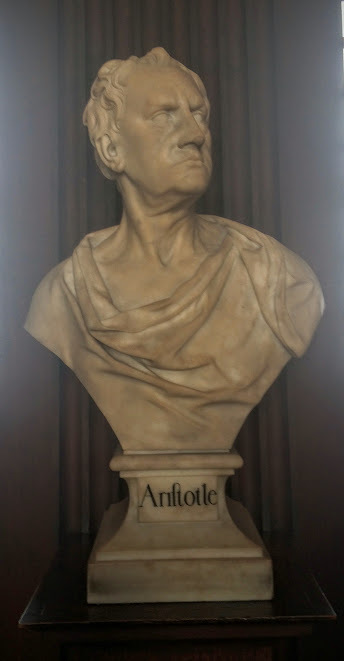 He also sculpted fourteen of the busts in the Long Room of the Trinity College Library in Dublin, including Homer, Aristotle and Socrates. Between 1970 and 1993, an image of Scheemakers’ Shakespeare statue appeared on the reverse of Series D £20 notes issued by the Bank of England. Scheemakers is credited with introducing broccoli to England in the 18th century. I have not done an exhaustive review of sources to check this claim, so you will have to do as I do and trust repetition on the internet. Broccoli resulted from breeding of cultivated Brassica crops in the northern Mediterranean starting around the 6th century BCE and since the time of the Roman Empire, broccoli has been popular in Italy. A common way to cook broccoli in Italy is one of my favorites and would honor the memory of Scheemakers: broccoli in oil and garlic. 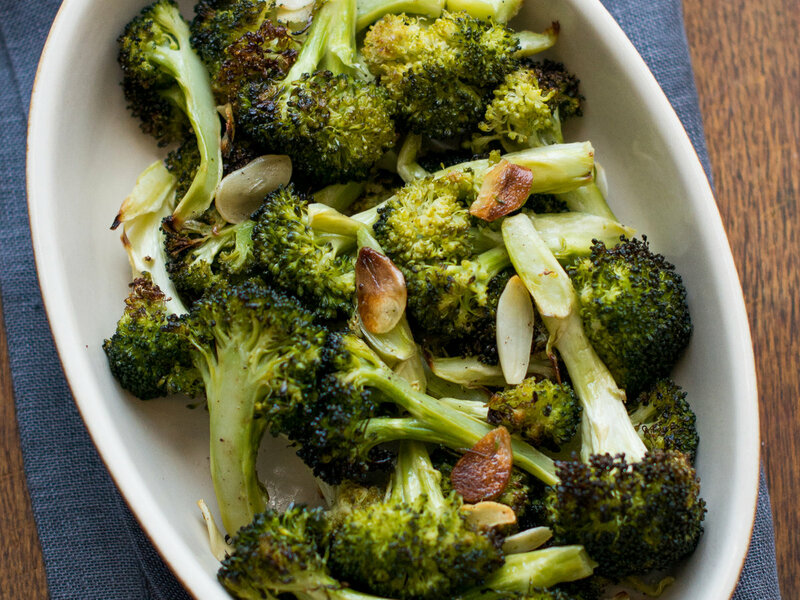 Steam the broccoli until it is al dente. Meanwhile gently heat extra virgin olive oil in a wide skillet and add sliced garlic to your taste. I like to add several cloves. Do not allow the garlic to brown, but let it infuse the oil. Drain the broccoli, let it air dry, then toss it in the oil and garlic. Serve immediately. In Italy it is quite common to serve this style of broccoli with macaroni or pasta of your choice.